Do you want to get fit for the New Year? Try Back to Hockey, whether it's your first time or you're returning to hockey. Back to Hockey is a great way for women to exercise as part of a team with a focus on fun, fitness and friendship. Back to Hockey provides a gentle introduction or re-introduction to hockey. It's open to all females whether you’ve played before or not. 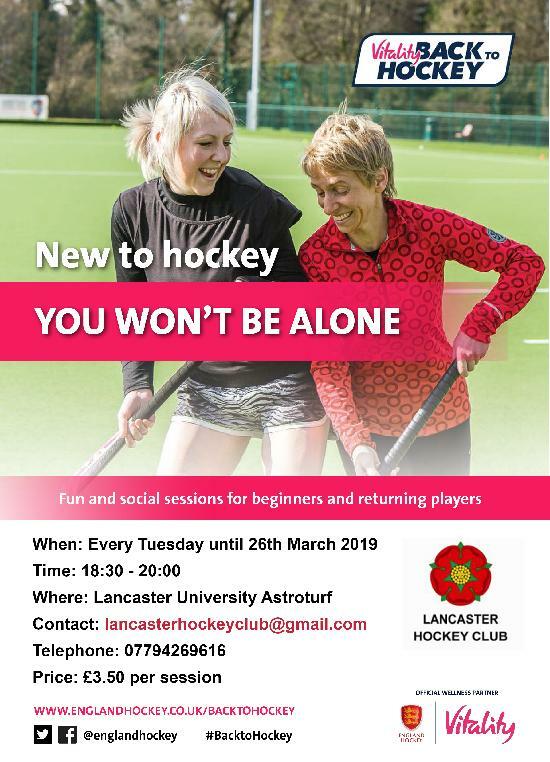 Maybe you’ve played hockey before at school, college or university, or perhaps in a club or work team, and who want to come back to hockey through the right programme. We welcome new participants to try hockey for the first time. It will provide you with a great opportunity to make new friends and enjoy training and playing in a friendly and relaxed environment. To register please contact Leighan Bleasdale on 07794 269616.